Save $15, with free shipping! “Slippery Fingers” is the more traditional and formulaic of the two selections: a light, relatively straightforward murder mystery with stock secondary characters and a “trick” revelation, ending with a garrulous confession by the just-nabbed perpetrator. 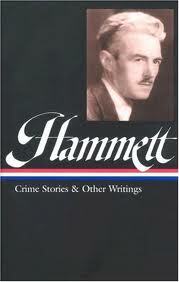 But it nonetheless shows Hammett expanding the genre’s boundaries with his use of language: “What makes the Op stories stand out,” writes LeRoy Panek in his study of the early fiction, “is Hammett’s introduction of slang into the Op’s dialogue and narration. Thus, . . . from the very beginning, Hammett sprinkled nonstandard diction into Op’s grammatically correct sentences.” The patois of Hammett’s rogues is even more notably mangled, serving “as a distinguishing feature of characters at the bottom of the criminal food chain.” Reading through the stories Hammett published during the 1920s, readers can see “the dean” of hard-boiled detective fiction developing his technique into the prose style that would culminate in such classics as The Maltese Falcon and The Thin Man. * Story of the Week will present “Crooked Souls” later this year. “The papers are full of it, and have been for three days,” I said, “and I’ve read them; but I’ll have to have the whole story first-hand.”. . . . If you don't see the full selection below, click here (PDF) or click here (Google Docs) to read it—free!